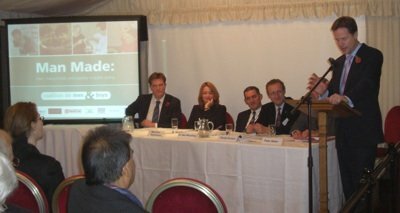 The offical launch yesterday of a report by the Coalition on Men and Boys backed by the Men's Health Forum was marked by a dramatic last minute entrance from Liberal Democrat leader Nick Clegg. According to Man Made: Men, masculinities and equality in public policy, public policy needs to respond urgently to the problems that men and boys create and the problems that they experience. This must take place alongside efforts to improve the position and status of women. The report, funded by the Equality and Human Rights Commission and the Government Equalities Office, was launched at a meeting for MPs and Peers in the House of Lords addressed by: MHF CEO Peter Baker, who is also chair of the Coalition; Sandy Ruxton, lead author of the report; Mary-Ann Stephenson of the Womenís National Commission; and, Dr Neil Wooding, a Commissioner for the Equality and Human Rights Commission. 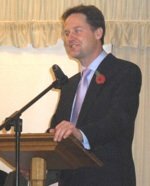 Danny Alexander, a Liberal Democrat MP and chair of the Liberal Democrat Manifesto Group spoke for Nick Clegg who was detained in the Commonís chamber by parliamentary protocol. However, the Liberal Democrat leader arrived hot foot shortly before the end of the meeting to declare his support for the report and his hopes that it got the 'cross-party hearing' it deserved. 'This is a really important report,' he said. 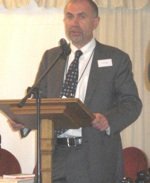 'I don't just say this as a young man, as a father of young boys, I don't just say it as a Sheffield MP that time and time again sees young boys get snarled up in the criminal justice system, and not just because I see this systemic underperformance of young boys in schools in my own neck of the woods in that great city, but because I think you have produced a lot of very compelling research, a lot of it very chilling reading too. 'You are also kind of opening an envelope, if you like, in the public debate which has been closed for too long. Because of the relative advantages enjoyed by men, advantages which persist, people have been reluctant to drill below that relationship of inequality to actually highlight the fact that for some groups of men, whether it's Asian men who are discriminated against or older men who find it difficult to access health care or, of course, the systemic underperformance of young boys, particularly boys from white working class backgrounds, African Caribbean backgrounds, we're just not dealing with those parts of society enough. The report looks in detail at the issues of violence, fatherhood, education, work, and health. It shows that public policy fails to engage with masculinity issues even though recent equality legislation (the gender equality duty) requires the different needs of both sexes to be taken into account. To prevent re-offending, every local authority should have a service for men who perpetrate domestic violence, argues the report. The problems men face due to long working hours and difficult-to-access primary health services must be tackled. Fathers need more support to enable them to be fully involved as parents. Schools should do more to educate boys about the need for respect within relationships and towards women and girls. Men themselves must take more responsibility for promoting gender equality and they have great potential to contribute positively to caring, health, education and anti-violence strategies. The report's lead author Sandy Ruxton said: 'It is often argued that economic and social change has hit men and boys so hard that they are 'in crisis', but in reality the effects are highly uneven. Whilst some men continue to dominate the top jobs in business, politics, the media, the public sector and the justice system, others at the sharp end of recession - particularly those in disadvantaged groups - are facing increasing unemployment and ill-health. Peter Baker concluded: 'The time is now right for public policy to address men, boys and masculinity in a more sophisticated way. We can't respond effectively to the many problems men and boys cause and the problems they face unless and until there is a genuine cross-government strategic commitment to focus on masculinity in the development of public policy.